Data Extraction Kit for Outlook is a unique product that combines the functionality of a powerful and fully configurable data extractor with that of a convenient tool for conducting forensic investigations. Its advanced built-in report generation mechanism allows for in-depth analysis of the contents of PST files, allowing security experts and investigators to find specific emails in PST files and convert them to the necessary format. This compact and intuitive tool offers the best time-tested features of its predecessors and complements them with a number of new ones, including a completely redesigned interface and unique email forensic analysis functions. The new product is intended for professionals and regular users who need a tool for quick and flexible conversion of the contents of Outlook PST storage files into other formats – either for importing into alternative applications, archiving, data migration or other purposes. The new product has all the features conveniently presented in a single main program window for ease of access and navigation. 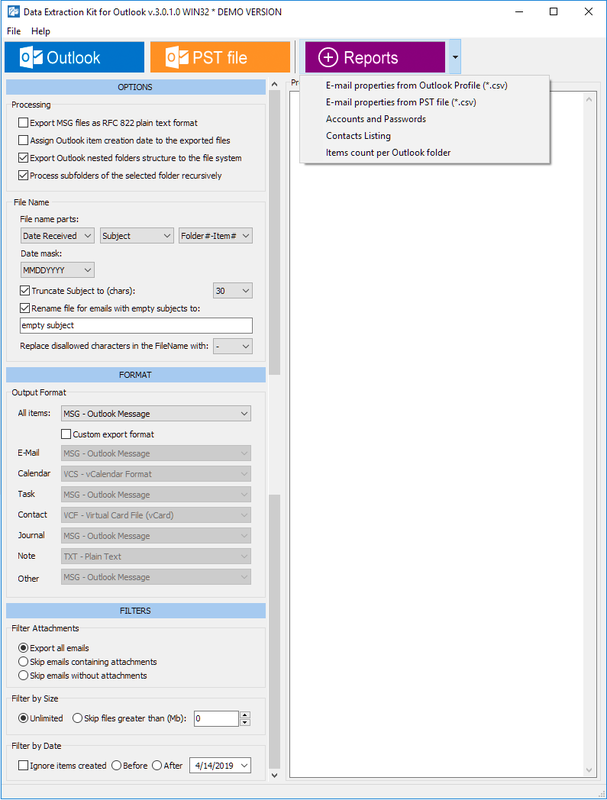 Data Extraction Kit for Outlook works with messages and attachments, contacts, notes, calendar items and other standard objects and converts them into a number of compatible formats, including MSG, RTF, TXT, EML, TNEF, HTML, MHT, VCF, VCS and ICS. The user can configure various aspects of the conversion process: from the replacement of unsupported characters in message subjects and preservation of the original folder structure to keeping the objects’ creation date and time intact. In order to facilitate the selection of the necessary items, the authors of the program implemented several filters that enable users to select files created before or after a particular date, containing attachments or without them, or being smaller than the specified threshold. Apart from rich data export and conversion capabilities, the product also enables administrators, investigators and other professionals generate reports. Slicksync Safari Synchronizer Basic makes it easy to synchronize your Safari bookmarks and settings to a local, network or removable drive!